Yet, the well-known Gemara (Shabbat 88a) interprets our verse in exactly the opposite way: “‘They stood at the bottom of the mountain’–This teaches that Hashem held the mountain over their heads and threatened, ‘If you accept the Torah, good! 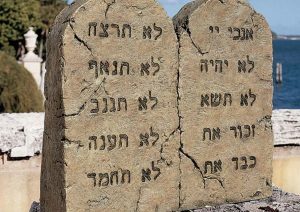 If not, right hear will be your burial place!’” This implies that Bnei Yisrael were not enthusiastic about accepting the Torah. R’ Michel Zilber shlita (Rosh Ha’yeshiva of the Zvhil yeshiva in Yerushalayim) writes: Early commentaries explain that the reason why Hashem rewards and punishes “Middah K’negged Middah” / “Measure-for-measure” is so that a person will know that he is being rewarded or punished and that events are not mere coincidence. When Hashem acts Middah K’negged Middah, continues R’ Zilber, He demonstrates the truth of several of the Thirteen Articles of Faith. He demonstrates the existence of reward and punishment. Also, He demonstrates that He exists and that He is all-powerful, as Yitro declared in our verse. R’ Meir Halevi Rottenberg z”l (1760-1831; Chassidic rebbe and rabbi in Apta and Stopnica) writes: Moshe Rabbeinu had every lofty quality that a person could have, and his preference was to “dwell” in higher worlds, with no connection to this world. Moshe’s speech impediment was a reflection of this, as someone whose thoughts are always on a lofty level has trouble communicating on a mundane level. How is it possible to see thunder? And, why did the people tremble? R’ Yosef Tzarfati z”l (early 17th century; Adrianople, Turkey) explains: People are more affected by what they see than by what they hear; for example, seeing a person drowning makes a different impression on a bystander than just hearing that someone drowned. And, people tend to believe what they see more than what hear; thus, we read (Esther 3:4-5), “They told Haman, to see whether Mordechai’s words would hold-up; for he had told them that he was a Jew. When Haman, himself, saw that Mordechai did not bow down and prostrate himself before him, then Haman was filled with rage.” But, when Haman only heard, he was not filled with rage. Midrash Tanna D’Vei Eliyahu Rabbah (ch.2) offers a different reason why the Torah was given publicly. Says the Midrash [brackets are from the commentary Shai La’mora]: To what may this be compared? To a king who had gems and pearls. His subjects came to him secretly and said, “Sell us your gems [so we can make you a crown].” The king said, “Instead, I will give them to you publicly. [Even though you will make me a crown from my own gems, I will consider it as if you gave me a gift. ]” This, too, is what Hashem did when He gave the Torah.